Agreement signed in Kazakhstan has potential to create over 70 new jobs with millions of pounds for UK’s leading hovercraft manufacturer. 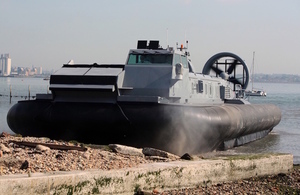 One of the world’s leading hovercraft manufacturers, Southampton-based Griffon Hoverwork, will carry out a study on using hovercraft to clear oil spills and support offshore rigs in the Caspian Sea. The agreement, signed today with Kazakh state oil company KazMunayGas’ subsidiary KMGSS and supported by the Department for International Trade (DIT), opens up a major new market to Griffon Hoverwork and the UK. Future contracts following the study are potentially worth over £100 million for new hovercraft supporting at least 70 jobs in the Southampton area. The signing took place as International Trade Minister Greg Hands visited the UK Pavilion at the Astana Expo, showcasing the UK’s world-leading expertise in oil and gas and other energy production. Griffon Hoverwork is a prime example of the UK’s engineering excellence, with the sort of world-leading expertise DIT is helping to showcase at the UK Pavilion in the Astana Expo. This agreement will see the UK using hovercraft to overcome complex environmental challenges in the Caspian Sea, with huge potential for jobs back in the UK. This agreement on enabling work for using hovercraft in the Caspian Sea is a huge step for Griffon Hoverwork and the UK. Its been great to have this meeting and signing, with the support of the Department for International Trade, ensuring that our UK-based engineering will help tackle the major challenges in the region. The Caspian Sea has seen water levels drop in recent years, potentially making large parts inaccessible to ships. Hovercraft have the ability to move over shallow water without disturbing oil spills, making them ideal for resupplying oil rigs in the area and cleaning up pollution. Griffon Hoverwork will carry out an environmental impact assessment, to ensure that hovercraft can be used without impacting on local ecosystems, using technology it has developed with Southampton University. The UK is already the sixth largest investor into Kazakhstan, and DIT has helped create 51 partnerships between UK and Kazakh companies since 2012. Greg Hands also announced a doubling of UK Export Finance financial support, up to £2.5 billion, available to UK companies looking to export to Kazakhstan, or to help Kazakh companies buy products and services from the UK. The founding companies behind Griffon Hoverwork helped develop the world’s first commercial hovercraft in the 1950s, and it already exports around the world from South America to the Far East. The announcement comes as another UK company, Aberdeen based IPSS, opened a new site manufacturing pipelines in Atyrau, Kazakhstan. This is the first facility the company has opened overseas, supported by DIT, to gain a strong foothold in one of the world’s key oil producing regions. The UK is participating at the Astana Expo which runs for 3 months, ending 10 September 2017. The UK Pavilion shows the UK at its creative best and is sharing the UK’s brilliant scientific and engineering expertise across the energy and mining industries.